Tulare Union High School student Conrad Santos stands on a ladder to reach some oranges at the top of a tree in a Visalia backyard. On most Saturday mornings, Tulare Union High School student Conrad Santos would be doing what your average teenager usually does, which is to say, not a whole lot. "That's what I'd be doing right now, watching TV or playing video games," says Santos. But today, he's standing on a ladder in a stranger's backyard, leaning deep inside a giant orange tree, trying to reach for that elusive piece of fruit that might otherwise go to waste. He's actually one of around ten volunteers taking part in a weekend community harvest sponsored by group called Be Healthy Tulare. Sarah Ramirez started the program a couple of months ago, out of a desire to bring the issues of health and nutrition together with building a stronger community. “I feel like this type of project, in a lot of ways, helps fill in some of the gaps. We know we have an excess amount of food. We know we have people who are hungry. How can we put the two together,” says Ramirez. Community harvest programs are popular across the state, such as Village Harvest in San Jose. But here in Tulare County, where so much of the state's fruit is grown, TC Harvest is the first program of its kind. And the potential here is huge. According to researchers at UC Riverside, around 60 percent of San Joaquin Valley homeowners have at least one citrus tree in their backyard. And quite often, a lot of that fruit goes to waste. “As you can see on the ground, that’s pretty much what happens to it. It falls on the ground and goes bad and gets wasted,” says David Terell, who is Ramirez’s husband and a teacher and football coach at Tulare Union. So far this year, the group has harvested over 12,000 pounds of fruit from backyard trees in Tulare and Visalia. Marty Zeeb is one of the homeowners taking part in the program. "These are two valencias that they are going to be picking there, there's a tangerine and a navel that also needs to be picked," says Zeeb. 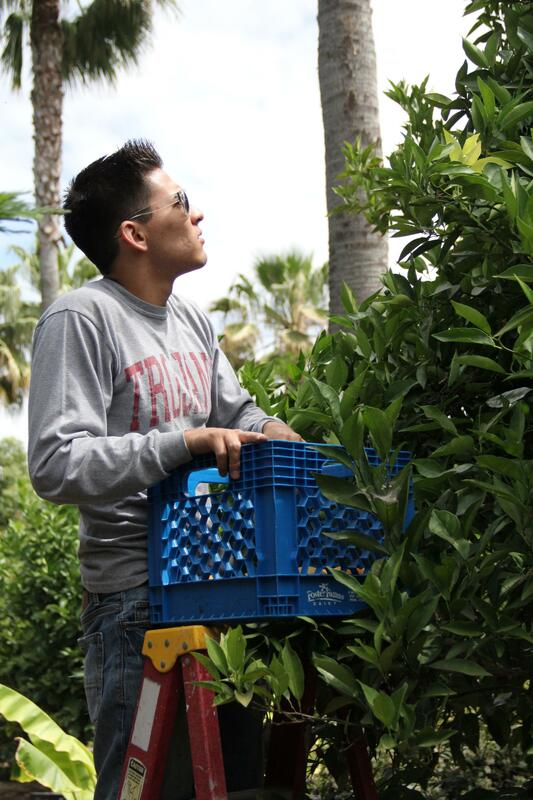 He says even after picking boxes and boxes of fruit for his family, “these trees produce a lot more than we can use. It's a good opportunity to share the wealth." And here in Tulare County, there are many people who are in need. According to the 2010 Census, 43 percent of adults in Tulare county live in a household that has struggled with food insecurity. “When we have a quarter of our county's population being served by FoodLink, obviously this is a problem. When one in three children under age 18 are food insecure, this is a problem,” says Ramirez. And it's that gap between abundance and poverty in the same community that spurred Ramirez to start this program. "This particular project is really thinking about how do we incorporate compassion, how do we incorporate hope and how do we cultivate a culture of service,” says Ramirez. Sandy Beals is the Executive Director of FoodLink, a Visalia based non-profit that provides food to needy families from its warehouse in north Visalia. "It's part of the community involvement model for a community taking care of its own. We call it waste meets want. So its food that might be in excess of what a family needs in its own backyard, but by sharing it, everybody wins,” says Beals. Every weekend the fruit that is picked by TC Harvest is delivered to Foodlink, and on the following Monday, residents from throughout the county line up to receive the nutritious food that they otherwise couldn't afford. "When people are going hungry the food they need the most is fresh fruit and vegetables. The studies show us that fruits and vegetables are the first thing that people cross off their list when their incomes go down and guess what, that's the food that all of us need to eat more of,” says Beals. But the recipients aren't the only ones who benefit from this program. Socorro Rios, who helped her longtime friend Ramirez start the volunteer harvests earlier this year, says it also teaches the group's volunteers a valuable lesson. "I love seeing kids out here working and I always tell them just be glad that you don't have to do this for a living. My parents had to do this for a living, Sarah and I have been out working in the fields. It's not the easiest thing. You don't make a lot of money doing it but somebody's got to do it,” says Rios.